COMMENTS:        This trigger occurred at longitude,latitude = 11.45,-6.82 [deg]. COMMENTS:        The XRT position is 0.82 arcmin from the BAT position. Dec(J2000) = -16d 25' 34"
with an uncertainty of 3 arcmin (radius, 90% containment, including systematic uncertainty). The BAT light curve showed a complex structure with a duration of at least 50 sec. The peak count rate was ~2000 counts/sec (15-350 keV), at ~6 sec after the trigger. Dec(J2000) = -16d 25' 10.4"
with an uncertainty of 2.3 arcseconds (radius, 90% containment). This location is 45 arcseconds from the BAT onboard position, within the BAT error circle. This position may be improved as more data are received; the latest position is available at http://www.swift.ac.uk/sper. A power-law fit to a spectrum formed from promptly downlinked event data gives a column density consistent with the Galactic value of 1.41 x 10^21 cm^-2 (Willingale et al. 2013). The initial flux in the 2.5 s image was 2.73e-09 erg cm^-2 s^-1 (0.2-10 keV). UVOT took a finding chart exposure of 150 seconds with the White filter starting 152 seconds after the BAT trigger. No credible afterglow candidate has been found in the initial data products. The 2.7'x2.7' sub-image covers 100% of the XRT error circle. Because of the density of catalogued stars, further analysis is required to report an upper limit for any afterglow in the sub-image. The 8'x8' region for the list of sources generated on-board covers 100% of the XRT error circle. Because of the density of catalogued stars, further analysis is required to report an upper limit for any afterglow in the region. No correction has been made for the expected extinction corresponding to E(B-V) of 0.19. The 5-sigma upper limit is about 18.5mag The message may be cited. The observations made on zenit distance = 64 degrees, galaxy latitude b = -11 degree. The moon (44 % bright part) below the horizon (The Moon altitude is -6 degree). The sun altitude is -22.7 degree. The object can be observed till sunrise at 2017-06-01 01:30:50 . We observed the field of the GRB 170531B (Evans et al.,GCN 21171) with with Zeiss-1000/Koshka telescope starting on May 31 (UT) 22:32:32, i.e. ~30 minutes after burst onset. We took several images in filter R with exposures of 180 s. Near the border of XRT error circle (Evans et al.,GCN 21171) we detect the source in coordinates (J2000) 19:07:31.67 -16:25:09.3 with uncertainity of 0.5 arcsec in both coordinates. The source is probably coincedent with the object reported by (Lipunov et al., GCN 21172). The source is fading from R=19.1 at (UT) 22:32:32 down to R=19.5 at (UT) 23:30:56. Most probably the source is an afterglow of GRB 170531B. Dec (J2000): -16d 25' 08.8"
We observed the afterglow of GRB 170531B (Evans et al. GCN=20 21171, Lipunov et al. GCN 21173, Pozanenko et al. GCN 21174)=20 using OSIRIS at the 10.4 m GTC telescope in La Palma (Spain).=20 Observation consisted in 3x900s exposures using the R1000B=20 grism, covering the range between 3700 and 7880 AA. The mean=20 epoch of the combined spectrum is 03:09:29 UT (5.12 hr after the=20 GRB onset). Additionally, g, r, i, and z-band observations were=20 obtained. We note that the coordinates of the afterglow are=20 19:07:32.09, -16:25:05.8 (J2000 +/-0.5=E2=80=9D), which places the GRB=20 approximately 5=E2=80=9D away from those of the source identified by=20 Lipunov et al. (GCN 21173) and Pozanenko et al. (GCN 21174).=20 The afterglow can be also detected in the early Swift/UVOT=20 images. In the acquisition image we measure a magnitude of=20 r_AB =3D 21.9 for the afterglow, as compared to PANSTARRS=20 catalogue field stars. The afterglow spectrum shows continuum throughout the=20 wavelength range and several strong absorption features=20 corresponding to Lyman-alpha, SiII, OI, CII, SiIV, CIV, AlII and AlII=20 at a common redshift of 2.366, which we identify as the redshift of=20 the GRB. We observed the field of GRB 170531B (Swift trigger 755354; Evans et al., GCN #21171) simultaneously in g'r'i'z'JHK with GROND (Greiner et al. 2008, PASP 120, 405) mounted at the 2.2 m MPG telescope at ESO La Silla Observatory (Chile). Observations started at 03:55 UT on 01-06-2017, 5.9 hours the GRB trigger. They were performed at an average seeing of 1.3" and at an average airmass of 1.3. We detect a point source within the 1.8" enhanced Swift/XRT error circle (Osborne et al., GCN #21175), and consistent with the afterglow position reported by Ugarte Postigo et al. (GCN #21177). Given magnitudes are calibrated against PanSTARRS and 2MASS field stars and are not corrected for the expected Galactic foreground extinction corresponding to a reddening of E_(B-V)=0.16 mag in the direction of the burst (Schlafly & Finkbeiner 2011). We acknowledge the excellent support provided by the Chilean observer at the telescope, and the support astronomer, Sam Kim, in obtaining these data. MASTER-Kislovodsk robotic telescope (2x4 square degrees, MASTER-Net: http://observ.pereplet.ru) was pointed to the GRB170531B (Evans et al., GCN #21171) 12 sec after notice time and 452 sec after trigger time on 2017-05-31 22:09:44 UT (Lipunov et al., GCN #21173). 3 sigma error = (+/-)2 arcsec (the source is marginaly visible). Our pixel is 2 arcsec. The offset from X-ray Swift position (Osborne at all) is 1.9 arcsec . The position of the Postigo et al. ( GCN 21177) is inside our error box (offset ~ 1.9 arcsec). The possible OT position Pozanenko et al. ( GCN #21174) offset ~ 8.2 arc sec. The OT detection image is available. We have analysed 6.8 ks of XRT data for GRB 170531B (Evans et al. GCN Circ. 21171), from 129 s to 52.1 ks after the BAT trigger. The data comprise 303 s in Windowed Timing (WT) mode (the first 10 s were taken while Swift was slewing) with the remainder in Photon Counting (PC) mode. The enhanced XRT position for this burst was given by Osborne et al. (GCN Circ. 21175). The late-time light curve (from T0+5.5 ks) can be modelled with a power-law decay with a decay index of alpha=1.18 (+0.25, -0.20). A spectrum formed from the WT mode data can be fitted with an absorbed power-law with a photon spectral index	of 1.45 (+/-0.04). The best-fitting absorption column is 6.5 (+2.7, -2.5) x 10^21 cm^-2, at a redshift of 2.366, in addition to the Galactic value of 1.4 x 10^21 cm^-2 (Willingale et al. 2013). The PC mode spectrum has a photon index of 2.07 (+0.13, -0.12) and a best-fitting absorption column consistent with the Galactic value. The counts to observed (unabsorbed) 0.3-10 keV flux conversion factor deduced from this spectrum is 3.4 x 10^-11 (4.7 x 10^-11) erg cm^-2 count^-1. If the light curve continues to decay with a power-law decay index of 1.18, the count rate at T+24 hours will be 3.3 x 10^-3 count s^-1, corresponding to an observed (unabsorbed) 0.3-10 keV flux of 1.1 x 10^-13 (1.6 x 10^-13) erg cm^-2 s^-1. The results of the XRT-team automatic analysis are available at http://www.swift.ac.uk/xrt_products/00755354. "On June 1.00 UT (T_0 +2.0h) we began observing the center of the field of GRB 170531B (Evans et al. GCN 211171) using the Las Cumbres Observatory 1m Sutherland facility. We performed a series of 10x60s observations in R and I band for a total of 10 minutes on sky in each filter. Seeing conditions were poor. These magnitude are calibrated against nearby USNO-B1 sources, and are not corrected for Galactic extinction." Dec(J2000) = -16d 24' 51.6"
with an uncertainty of 1.5 arcmin, (radius, sys+stat, 90% containment). The partial coding was 96%. The mask-weighted light curve shows a multi-peaked structure that starts at ~T0 and ends at ~T+180 s. T90 (15-350 keV) is 164.13 +- 8.82 sec (estimated error including systematics). The time-averaged spectrum from T+0.55 to T+181.67 sec is best fit by a simple power-law model. The power law index of the time-averaged spectrum is 1.95 +- 0.14. The fluence in the 15-150 keV band is 2.0 +- 0.2 x 10^-6 erg/cm2. The 1-sec peak photon flux measured from T+42.71 sec in the 15-150 keV band is 0.8 +- 0.2 ph/cm2/sec. All the quoted errors are at the 90% confidence level. Using the ANDICAM instrument on the 1.3m telescope at CTIO, we obtained optical/IR imaging of the error region of GRB 170531B (GCN 21171, Evans et al.) at two epochs (with mid-exposure times of 2017-06-01 04:22 UT & 08:19 UT). For each epoch, several dithered images were obtained with total summed exposure times amounting to 36 minutes in I and 30 minutes in J. The Swift/UVOT began settled observations of the field of GRB 170531B 152 s after the BAT trigger (Evans et al., GCN Circ. 21171). We detect a possible afterglow consistent with the position given by GTC (de Ugarte Postigo et al., GCN Circ. 21177) and MASTER (Tyurin et al., GCN CIrc. 21179). with an estimated uncertainty of 0.1 arc sec. (radius, 90% confidence). This position is 3.0 arc sec away from the enhanced XRT position (Osborne et al. GCN Circ. 21175). Given the fading, detection by other observatories and lack of matching source in the DSS, we find it likely to be the GRB afterglow. The magnitudes in the table are not corrected for the Galactic extinction due to the reddening of E(B-V) = 0.19 in the direction of the burst (Schlegel et al. 1998). 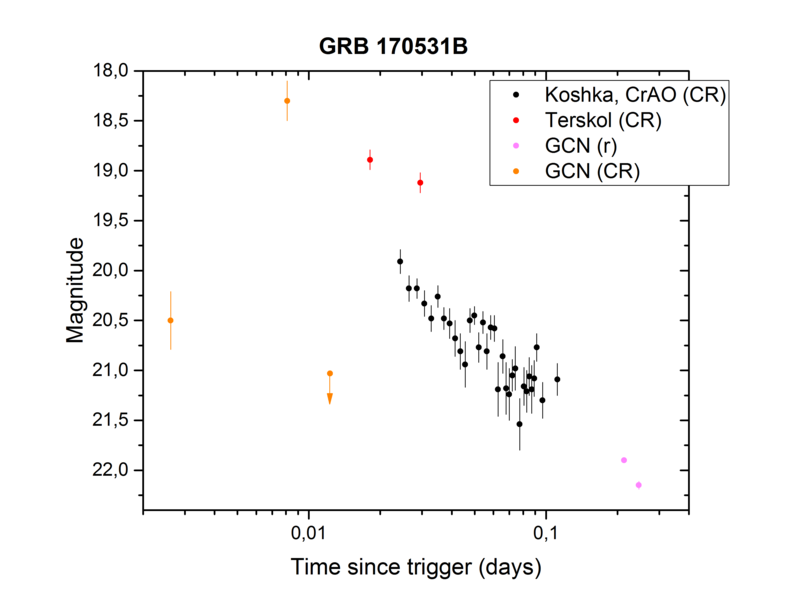 We observed the afterglow of GRB 170531B (Evans et al. GCN 21171; Lipunov et al. GCN 21173; Pozanenko et al. GCN 21174) with the 4.2m William Herschel Telescope on La Palma, using the ACAM instrument. We obtained a spectrum, consisting of 4x900 seconds exposure time, starting at 02:55 UT on 1 June 2017. Our wavelength coverage is ~4500 - 9500 A. We detect a small number metal lines (at low S/N) at a redshift consistent with that obtained by de Ugarte-Postigo et al. (GCN 21177). We warmly thank the staff of ING, in particular Raine Karjalainen, for their assistance. The coordinates of the afterglow (source A in the finding chart) are (J2000) 19:07:32.10 -16:25:06.0 with uncertainty of 0.5 arcsec in both coordinates. The coordinates are consistent with the position reported by de Ugarte Postigo et al., GCN 21177, Tyurina et al., GCN 21179, and Siegel et al., GCN 21188. Due to presence of sources in near vicinity to the afterglow the photometry of wide FOV telescopes might be affected by the sources. In particular our photometry reported in GCN 21189 is apparently biased by the two sources C and D (see the finding chart). We report coordinates and brightness of the nearby sources. Source  coordinates(J2000)          AG distance  filter  mag. err.